Add a touch of flavor to your rice to make the meal burst to life. The light hint of coconut is a pleasant surprise when you add this side to your meal prep or dinner menu. 1 cup uncooked rice – I have tested it with Brown, Jasmine, and Basmati with equal results. 2 Tablespoons diced onion – purple adds a wonderful splash of color in this recipe! 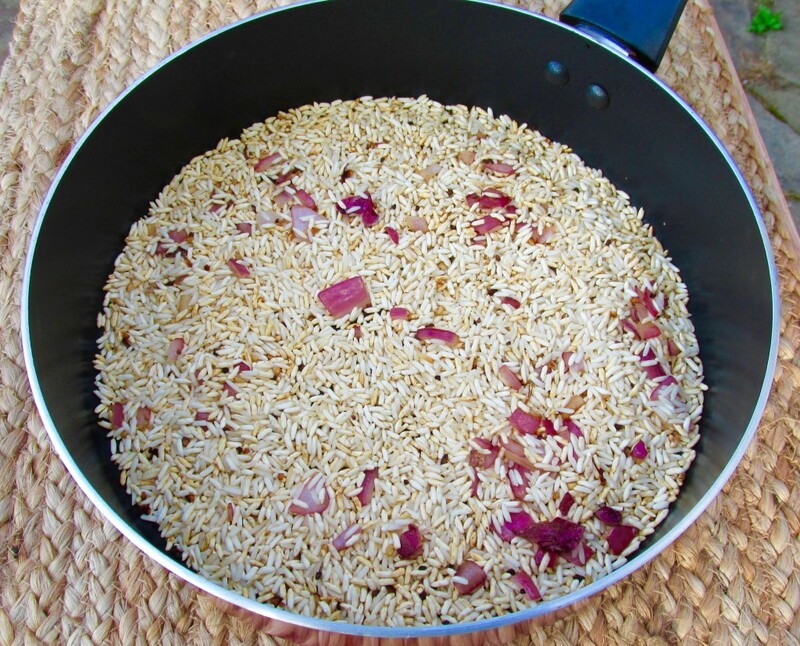 I used a 9″ deep skillet to make the rice. It allows for even cooking of the rice. Use olive oil pan spray or 1 teaspoon of olive oil in the bottom of the pan. On medium heat, add diced onion and cook for about three minutes to soften. 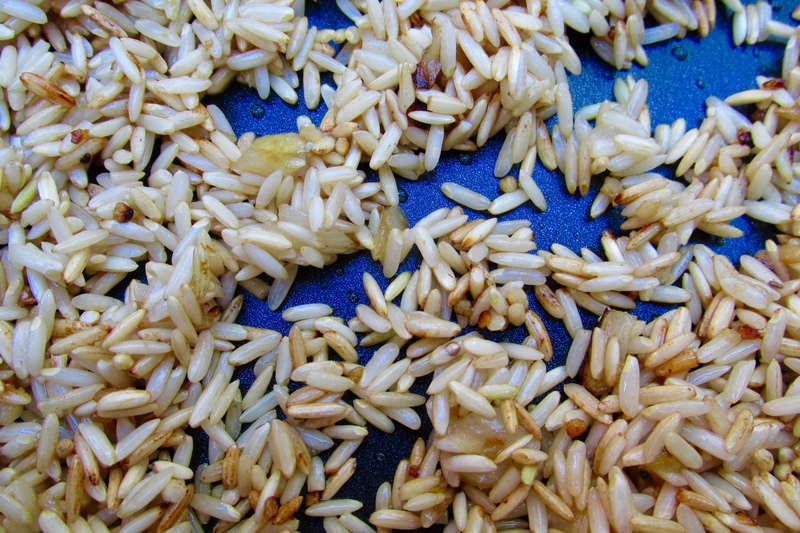 Add rice and chopped garlic and continue to cook, stirring frequently to slightly toast the majority of the rice to a nice golden brown. 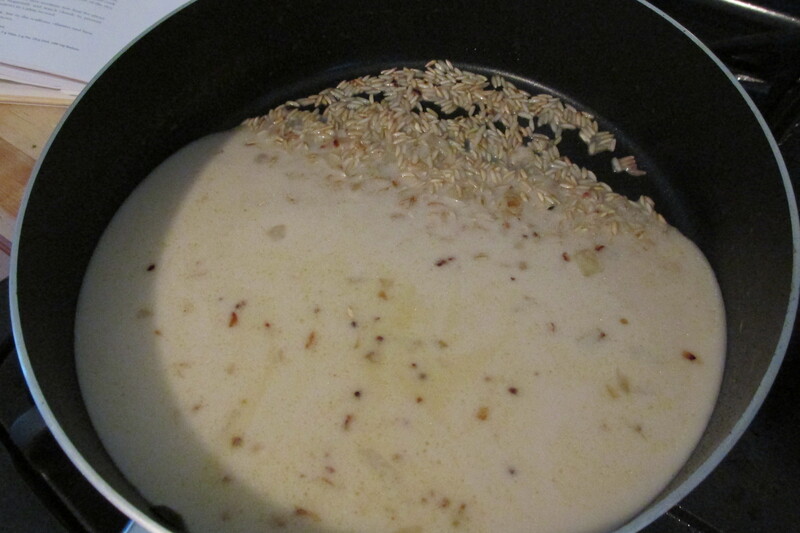 Add the vegetable broth, lite coconut milk, and sea salt. Bring to a gentle simmer and cover. Stir approximately every 5 minutes. The basmati and the brown rice will take about 40 minutes to absorb all of the liquid and the jasmine will take about 25 minutes. When all of the liquid is absorbed by the rice, stir in the diced green onion. Cover and let rest for 5 minutes. 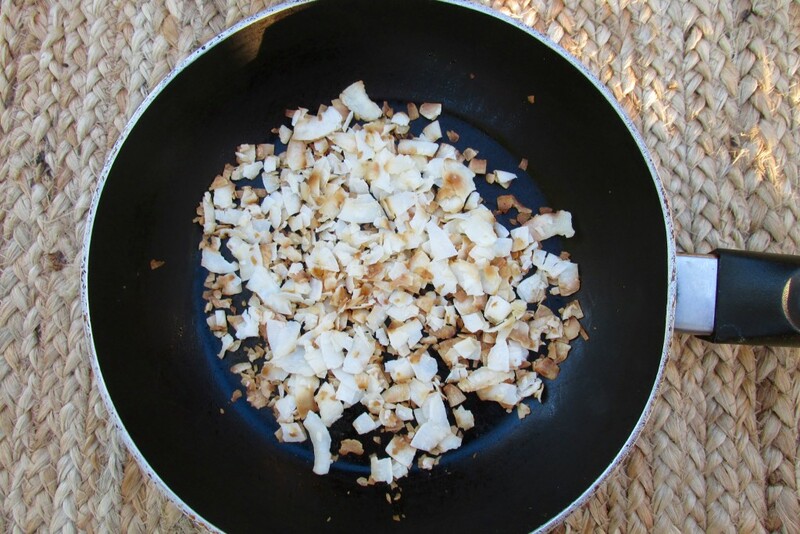 If you choose to add the flaked coconut, toast gently in a non stick sauté pan over medium heat while rice is turned off and covered. Stir frequently. The coconut flakes will be golden and ready very quickly. 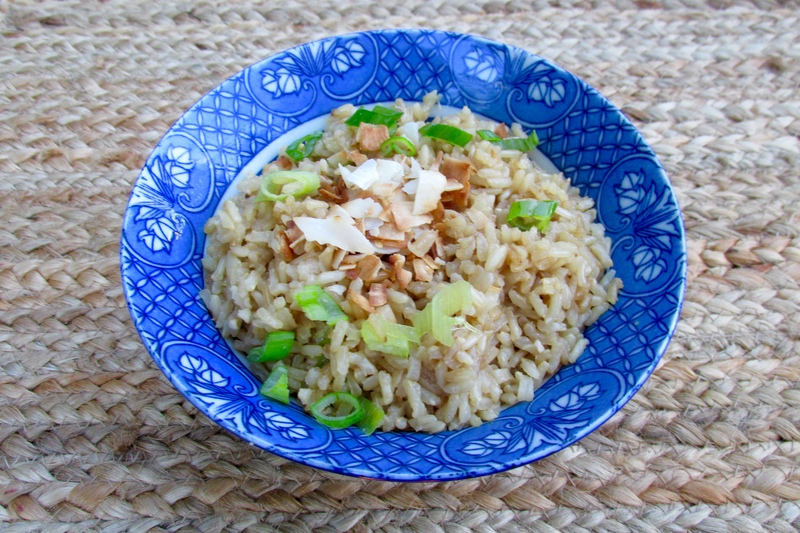 Top rice with toasted coconut flakes. 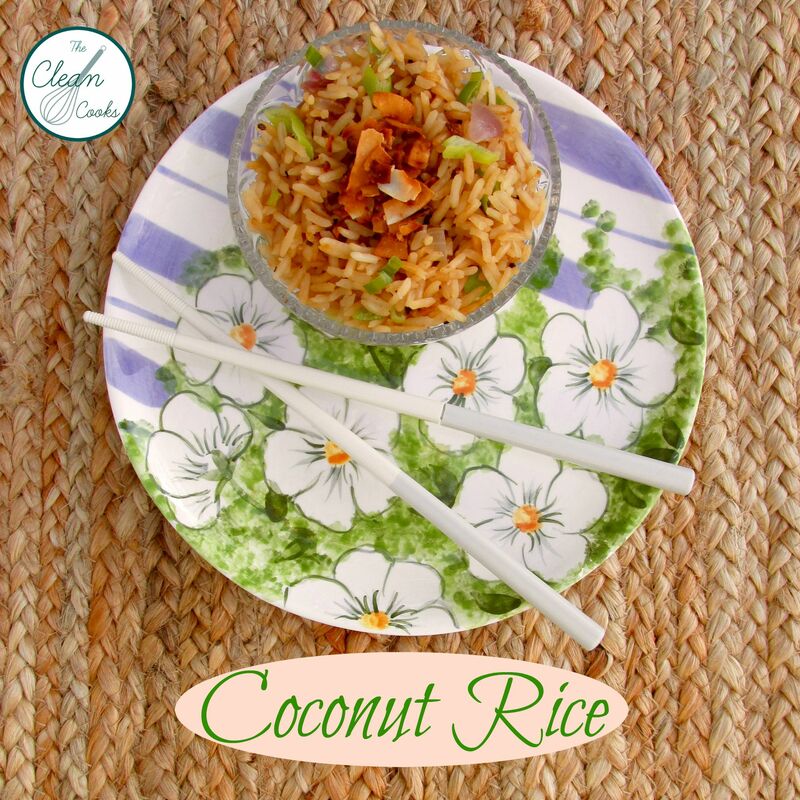 Coconut rice with a hint of flavor that adds a pleasant surprise to the meal. In a 9″ deep skillet use olive oil pan spray or 1 teaspoon of olive oil in the bottom of the pan. On medium heat, add diced onion and cook for about three minutes to soften. 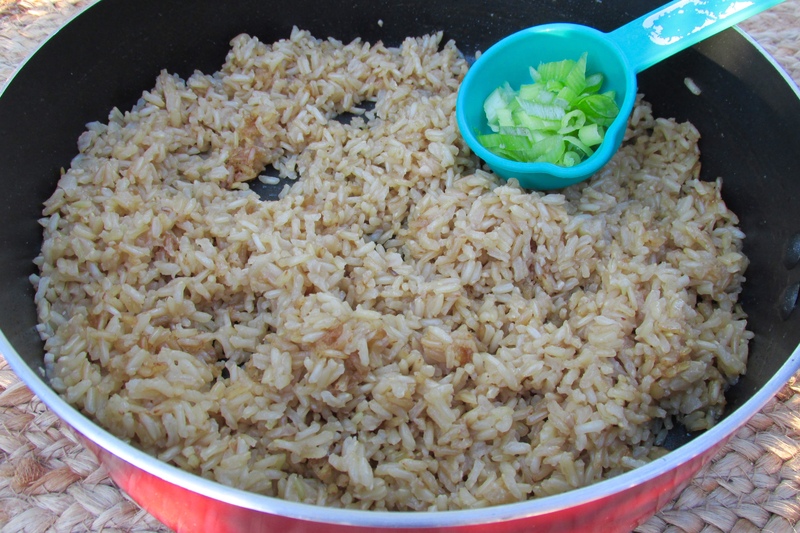 Add rice and chopped garlic and continue to cook, stirring frequently to slightly toast the majority of the rice to a nice golden brown. Add the vegetable broth, lite coconut milk, and sea salt. Bring to a gentle simmer and cover. Stir approximately every 5 minutes. If you choose to add the flaked coconut, toast gently in a non stick sauté pan over medium heat while rice is turned off and covered. Stir frequently. The coconut flakes will be golden and ready very quickly.